If you couldn't tell from reading this blog...I am a bit obsessed with photos. I especially like to capture photos of my kids and our "soon to be" blended family together! Artifcact Uprising offered me a $25 credit to their website only, for this review/feature of one of their products. I was not offered any monetary compensation. I also had to personally pay the remainder & shipping on my own accord to get these photos delivered! I've watched such a transformation, especially in my kids smiles over the past couple years and it's something that warms my heart all the way, to see documented in photos. It's like...you can actually see happiness and peace all over their faces and this makes me exceptionally happy! So as we plan for our wedding...I'm still trying to find unique ways to display things like, our pictures, that will be something that not only I will love the look of, but that everyone who attends will cherish too. I don't want them "just for the wedding" either. If I'm going to put money out, the stuff for the wedding needs to be something we can use for our family after the wedding too! I'm trying to be as resourceful as I can be...financially! 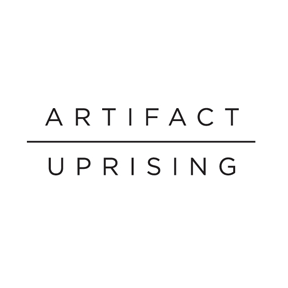 I found a website called Artifact Uprising. 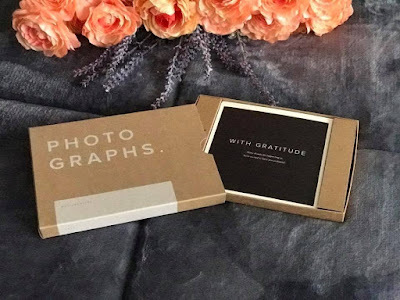 They do amazing invitations, beautiful birthday announcements, drop dead gorgeous wall hangings, brilliant photo reprints, photo books, etc. I just love their stuff! 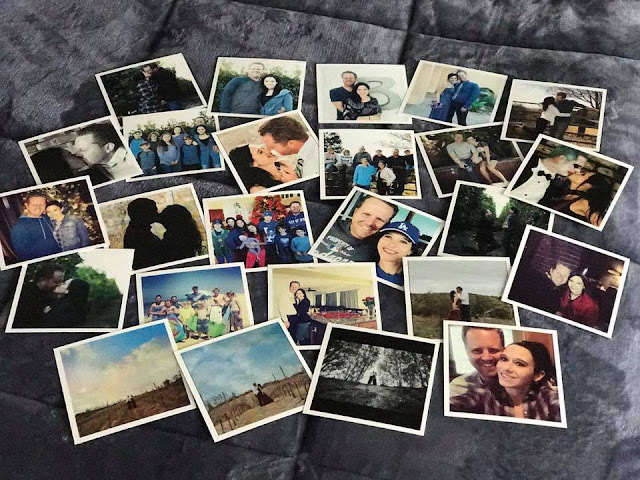 Since we have so many pictures of us...in happy moments over the past 2 1/2 years together, I had a hard time choosing just 25 photos to have printed...but I managed! I selected some of my favorites (that were uploaded to my instagram account) that were probably taken recently, but I feel are a good representation of moments and smiles that have been created out of the sweetest moments of our "BLENDING" so far. I ordered the Square Photo Print Set. 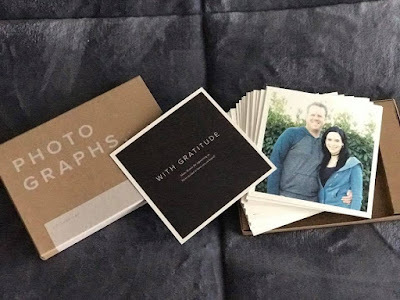 The best part, it was super easy to upload, because I basically connected my instagram account to their website and selected the photos I wanted printed. Added them to my cart, paid and waited for them to arrive! This box arrived and it came on a day that it was literally downpouring. Ughhh! I was afraid that it may have damaged some of the pictures inside, but luckily for me, they package these photos in such an amazing way. And phew, I am super thankful too! Inside this box were 25 of my favorite memories, printed on heavy, cardstock like paper. They have a matte finish and also a white border. These are perfect for our wedding and even for our home after! The box they came in can be used for storage of them too, it even has a place to write on the outside, what is tucked sweetly inside. To say I love these prints is to put it mildly! These will be displayed one way or another during our reception. 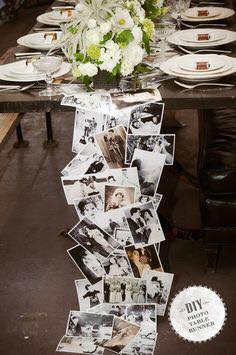 My oldest daughter thinks I should make something like this pinterest pin we found, that uses the pictures as a table runner on our "head table" (see pin below). But I also think it would be cute to use clothes pins and display them strung up above our desert table. Such a dilema, but a great one to have! I really am not sure how they will be displayed, but they will most definitely be proudly highlighted during our reception. I just know everyone will love them too! How do you think I should use these Square Photo Prints in our wedding reception? CLICK HERE to learn more about Artifact Uprising and if you have a special events coming up, you need invites for, you're having a baby and want unique birth announcements (they just started making them), maybe you're planning a wedding & need some awesome invites or you want to have a photo book made...you'll be shopping there too! TRUST ME! I was not paid to feature this post! 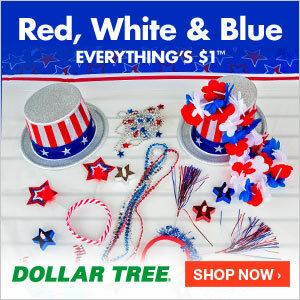 I was offered a $25 store credit to use towards any purchase in their online store. I had to pay the remainder as well as the shipping on my own!